Oh the internet . . . it’s a blessing . . . it’s a curse. Have you ever found yourself thinking; I’ll just look at Pinterest for a minute or two, before I vacuum or dust? Two hours later, you realize that it’s two hours later! 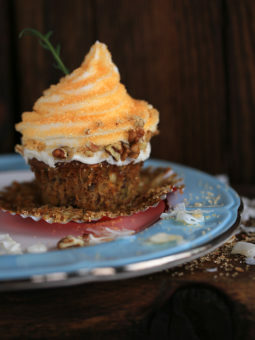 One of those pictures took me to Saveur the other day, where I came across this yummy recipe for Hummingbird Cake. I was looking for something that would serve two purposes. (1). Something my favorite person would actually enjoy eating. (2). Something I could take to a Luncheon. Hummingbird cake is known for its fruit & nut filled batter. No chocolate . . . it screamed his name. Check: He’s a fruit-a-holic as well as a nut. Heck, we can’t eat a full cake, so I opted to make cupcakes instead. Everyone seems to like their very own cupcake. This particular recipe honors the legacy of the Southern cook Edna Lewis, and the cake is served in Atlanta’s Watershed restaurant. I can see why, it’s really that good. 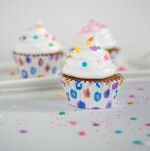 See that glossy speckled frosting on top? It’s Vanilla Bean Marshmallow Frosting. Oh, it’s finger licking good, and seems to sit perfect on any cupcake. The actual recipe posted below, calls for Cream Cheese Frosting. If I want my sweet half to share in the eating of said cupcakes . . . they can’t be topped with cream cheese frosting. I made both! If you want tiny black vanilla flavored speckles in your frosting, you must buy whole Vanilla beans. You can find them in the spice section of most grocery stores. They come in spice jars – 2 to 3 to a jar, and they are a tad expensive. Your eyes roll to the top of your head when you see the price! Buy them at least once in your life-time. You simply take the sharp end of a paring knife and carefully make a slit down the center of the brown bean. Lay back the skin on each side, and you will see all the glorious little black speckles of seeds. Carefully take your knife and scrape all that paste away from the skin. You can add it to your frosting for a blast of vanilla. I found Watkins Madagascar Vanilla Beans at Walmart, and they made my frosting quite spectacular. 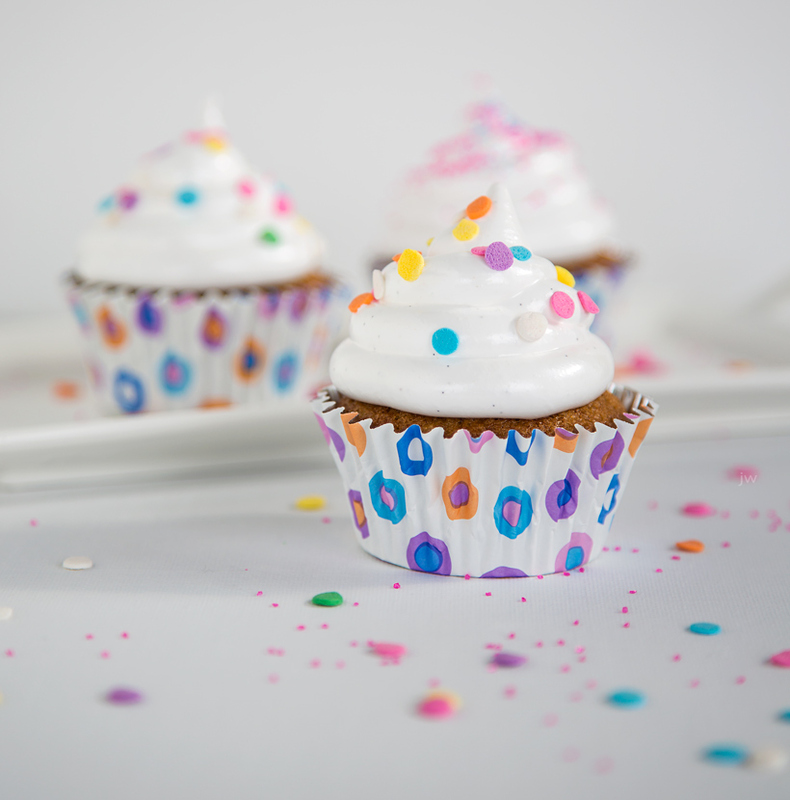 Either frosting you decide to make, will be beautifully paired with the Hummingbird cake. 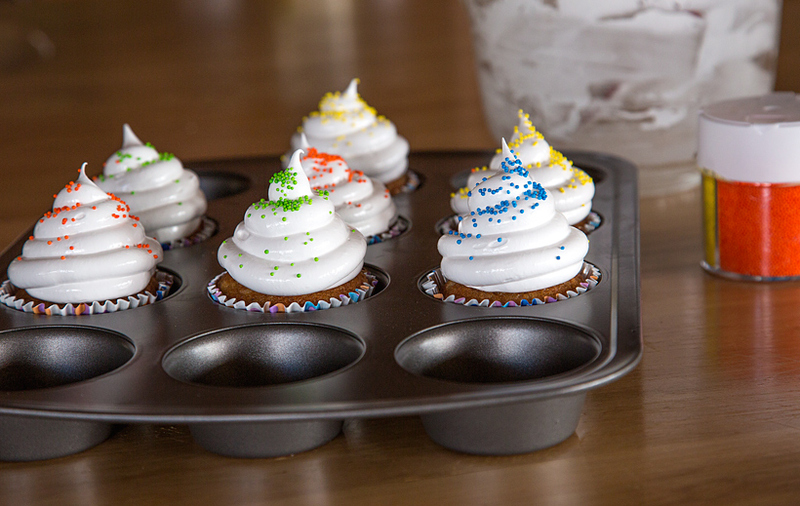 Whipped cream would also sit proudly on top of these little cupcakes. They are very similar, but we really think that this Marshmallow frosting is much better. It’s not quite as sweet as your typical frosting. I think that’s why my husband likes it. He’s just not much of a sweets guy. The addition of Karo keeps it from getting a shell as it sits, and it never turns sugary. 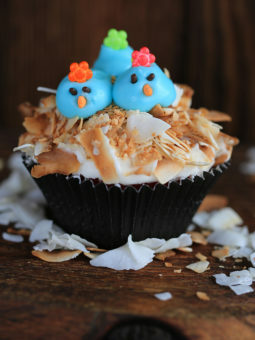 Easter is coming soon, and these cupcakes would look pretty cute sitting on your table. Everyone would have marshmallow mugs! It’s pretty delicious on Chocolate cupcakes as well. 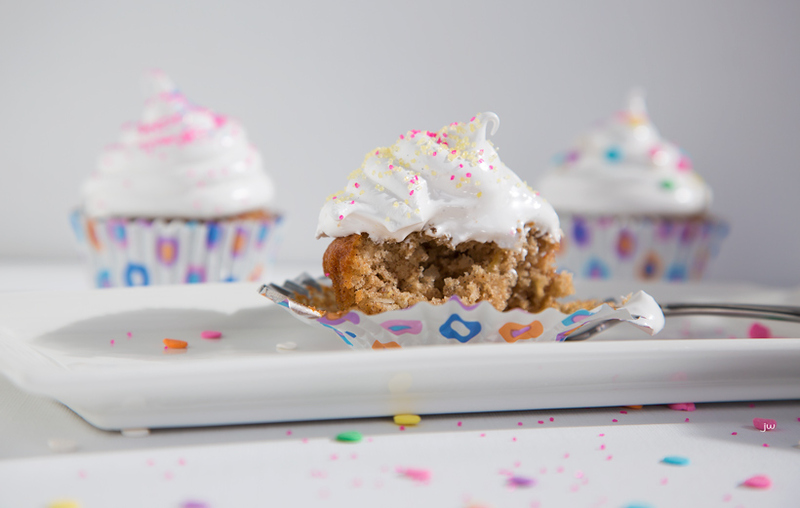 I’ll give you a few tips that will ensure Marshmallow Frosting success. 1. Make sure your egg whites are at room temperature. 2. Use regular granulated white sugar or extra fine white sugar. (small crystal sugar) Not sure about your sugar? To make extra fine sugar, you can process the sugar in a food processor. 3. Brand name Karo – light corn syrup seems to work best. It always works best in Divinity as well. 4. Use pure Vanilla extract – not imitation. 5. See that pink glass? I have a pastry bag + 1A tip ready for piping. Here are my 2 egg whites + 1/4 tsp. salt mixed until frothy. It’s not stiff, it’s like a nice soft bubble bath! Add 1/4 cup of sugar . . . very . . . very . . . very . . . very . . . very . . . slowly . . . while beating the entire time. I repeat . . . don’t add the sugar all at the same time. SLOWLY! Like 1 teaspoon at a time. Look . . . see . . . After you add that 1/4 cup of sugar . . . it is stiff and pretty . . . and glossy . . . like this. It’s not done though! You still need to add the Karo syrup + vanilla. Now begin adding the 3/4 cup of Karo syrup very . . . very . . . very . . . very . . . very . . . very . . . very . . . slowly . . . while you continue beating the entire time. Continue beating and beating and beating until the Marshmallow frosting is STIFF, STIFF, STIFF! When you pull your beaters up, it stands at command! I promptly put my frosting in a bag with a 1A tip, and pipe swirls on my cupcakes. 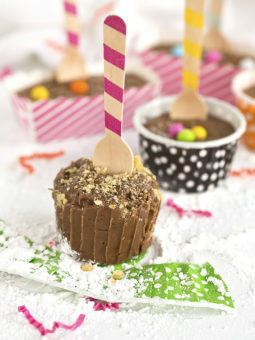 You can simply take a knife or even a spoon and make pretty swirls on your cake or cupcakes with that as well. This frosting would even make an ugly cake beautiful! note: If I was making a 3 layer cake or even a 9x 13 cake, I would want to double the Marshmallow frosting recipe below. You can use a hand mixer or a stand mixer. Everyone wants to lick the beaters! I love all the new foil lined cupcake wrappers. They don’t lose their color while baking, and they don’t get greasy! Make Hummingbird Cake or Cupcakes with Vanilla Bean Marshmallow Frosting or Cream Cheese frosting today . . . they stay moist and are mmmmmmm good. This hummingbird cake is a moist fruit & nut filled cake. Delicious with Cream Cheese, Marshmallow or 7-minute frosting. 1. Make the cake: Heat oven to 350°. Line the bottoms of three 9″ round cake pans with parchment paper. Grease each pan with 1 tbsp. butter and dust with a little flour; shake pans so that flour evenly coats them. Invert pans and tap out excess flour; set pans aside. 2. In a large bowl, sift together the flour, cinnamon, baking soda, and salt; stir in the pecans and set aside. Using a handheld mixer set on high speed, beat the sugar, brown sugar, and eggs in a large mixing bowl until smooth, 1 minute. Add the crushed pineapples and their juice, bananas, oil, and vanilla and mix until combined. Add the pecan mixture and mix on low speed until evenly combined. 3. Divide the batter evenly between the 3 prepared cake pans, smoothing the tops with a rubber spatula. Bake cakes, rotating occasionally, until a toothpick inserted into the center of each cake comes out clean, about 50 minutes. Transfer cakes to racks and let sit for 15 minutes; invert pans and unmold each cake; discard parchment paper. Let cakes cool. 4. Make the frosting: In the bowl of a standing mixer fitted with a paddle, beat the butter on medium speed until smooth, 2 minutes. Add the cream cheese and vanilla and beat until creamy, 1–2 minutes more. Add the confectioners’ sugar and mix on low speed until incorporated. Increase speed to medium-high and continue mixing until the frosting is light and fluffy, 2–3 minutes. Remove any dust from the pecans by shaking them in a wide-mesh sieve over the sink; using a rubber spatula, fold the pecans into the frosting. 5. Assemble the cake: Place 1 cake layer on a cake stand. Using a butter knife, spread 2/3 cup frosting evenly over the top. Place second cake layer atop first one and frost top of it with another 2/3 cup frosting. Repeat with remaining cake layer. Spread remaining frosting over the sides of the assembled cake. Serve immediately or wrap loosely with plastic wrap and refrigerate. Make the cake: Heat oven to 350°. Line the bottoms of three 9″ round cake pans with parchment paper. Grease each pan with 1 tbsp. butter and dust with a little flour; shake pans so that flour evenly coats them. Invert pans and tap out excess flour; set pans aside. In a large bowl, sift together the flour, cinnamon, baking soda, and salt; stir in the pecans and set aside. Using a handheld mixer set on high speed, beat the sugar, brown sugar, and eggs in a large mixing bowl until smooth, 1 minute. Add the crushed pineapples and their juice, bananas, oil, and vanilla and mix until combined. Add coconut if desired. Add the pecan mixture and mix on low speed until evenly combined. Divide the batter evenly between the 3 prepared cake pans, smoothing the tops with a rubber spatula. Bake cakes, rotating occasionally, until a toothpick inserted into the center of each cake comes out clean, about 50 minutes. Transfer cakes to racks and let sit for 15 minutes; invert pans and unmold each cake; discard parchment paper. Let cakes cool. Make the frosting: In the bowl of a standing mixer fitted with a paddle, beat the butter on medium speed until smooth, 2 minutes. Add the cream cheese and vanilla and beat until creamy, 1–2 minutes more. Add the confectioners’ sugar and mix on low speed until incorporated. 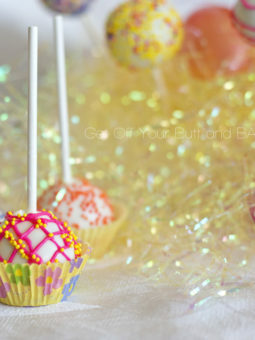 Increase speed to medium-high and continue mixing until the frosting is light and fluffy, 2–3 minutes. Remove any dust from the pecans by shaking them in a wide-mesh sieve over the sink; using a rubber spatula, fold the pecans into the frosting. Assemble the cake: Place 1 cake layer on a cake stand. Using a butter knife, spread 2/3 cup frosting evenly over the top. Place second cake layer atop first one and frost top of it with another 2/3 cup frosting. Repeat with remaining cake layer. Spread remaining frosting over the sides of the assembled cake. Serve immediately or wrap loosely with plastic wrap and refrigerate. Double this recipe for a generously frosted 9×13 inch cake, or for a 3 layer cake. Beat together 2 egg whites and 1/4 tsp. salt with mixer until frothy. Add 1/4 cup sugar very, very slowly and beat continuously until smooth & glossy. Slowly add 3/4 cup light corn syrup. Beat mixture until it holds very stiff peaks. Fold in 1 1/4 teaspoons pure vanilla extract. Spread on cakes, cupcakes or in between cookies. I LOVE that you called Dad your favorite person. HOW CUTE IS THAT??? Seriously you are so cute Mom. I don’t know if I have ever had hummingbird cake, but think it sounds really good.